SLUG is an English word that means "small lumps" and we manufacture it by punching the rolling sheet with a press mold. By manufacturing a press mold you we can create a variety of shapes. 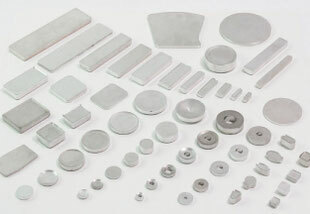 It is widely used as a material for cold forging and impact processing. In the case of cold forging, the process can be started from the lubrication process (bond process etc. ), and the process of cutting the extruded bar material can be omitted. 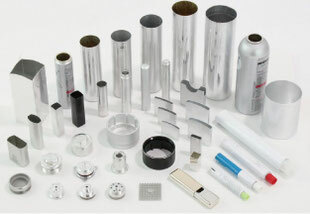 Aerosol cans, medical tubes, HDD hubs, automobile parts etc. Please answer "yes" or "no" to the following points. there are times when the ability of the bar cutting machine can not cope with fluctuations in order of products. It is troublesome to scrap cutting waste, and material yield is also concerning. The 5S in the factory hardly progresses due to mess of cutting waste and oil. Burrs on the cut surface and traces of saw tooth may cause poor quality. I am concerned about the time and cost of cutting (waiting). Those who have answered "yes" to any of the points should reconsider the slug material.